Potatoes with bacon and liver is my sneaky solution to ensuring my family consumed adequate amount of this nutrient-dense, old-fashioned staple. Yes, I still love my Chicken Liver Pate, and my son consistently asks for Fried Chicken Livers, but, beyond these tried-and-true staples, I still struggle with putting liver on the plate regularly as I ought to. That is, until I found this recipe for Potatoes with Bacon and Liver when I was visiting my friends Hannah and Alex who served it with broiled lamb chops, some greens and a glass of red wine. We loved it, and I’m sharing it with you now. Now, it seems that every time I mention liver on the Nourished Kitchen Facebook Page, there’s an inevitable onslaught of squalls that go something like this: “But the liver is the body’s filter!” “I would never eat liver! It’s a storehouse for toxins!” “I love liver, but it’s too high in cholesterol to eat.” Now, it’s none of my business how you choose to eat or what you choose to eat, but I do want to set the record straight on liver. Liver is one of the most concentrated sources of vitamins and minerals. Liver is extraordinarily nutrient dense, and while kale might be the darling of the health food movement right now (and I still love to use kale in my recipes), liver offers more folate and more minerals than does kale, and is very much a nutritional powerhouse. It is one of the most concentrated sources of vitamins and minerals available to us, as liver is rich in vitamin A, riboflavin, vitamin B6, niacin, folate, vitamin B12 as well as minerals like iron, zinc, phosphorus, manganese and selenium. Consuming both antioxidant-rich plant foods and nutrient-dense animal foods provides a natural balance that is so often missing in Americans’ typically distorted relationship with food. Its liver’s concentrated source of nutrients, particularly true vitamin A, folate and load of minerals that fosters the optimal nourishment for people across all ages and spectrums. This is why traditional peoples studied by Dr. Price in his landmark book Nutrition and Physical Degeneration often considered liver to be a sacred food (along with foods like shellfish, fish roe, bone broth and raw dairy), and emphasizing its importance for pregnancy, lactation and early childhood, and why it’s often considered to be a food for fertility. That’s the reason I also feature a liver recipe every few weeks in Nourished Kitchen’s meal plans. Liver neutralizes, but does not store toxins. The liver functions to neutralize environmental toxins as well as toxins we (or other animals) consume like antibiotics, pharmaceutical drugs and other potential toxins. While the liver functions to neutralize these toxins, they are not stored in the liver; rather, if they cannot be eliminated through the body’s waste functions, they’re likely to be stored in visceral fat. To avoid liver in an effort to avoid “toxins” is futile, as liver doesn’t store toxins and, in that effort, you’ll also be avoiding one of nature’s most concentrated source of nourishment. Further, all animal foods whether muscle meat, organ meat, bones for broth, or fat, are best when they come from healthy, grass-fed or pasture-raised animals. In my experience, the idea of eating liver might be more off-putting than actually preparing, serving and consuming it. And while I won’t lie and tell you that liver is one of my favorite foods (it’s not), it can be delicious as in this recipe for Chicken Liver Pate or this one for Fried Chicken Livers. And if you or your children don’t care for liver, you can always blend it with ground meat as in this Pizza Chili or these Chicken Nuggets where other flavors help to disguise its characteristic mineral-like qualities. And if you’re convinced of liver’s benefits, but are still stumped as to how to prepare it, consider checking out the Nourished Kitchen Meal Plans which feature liver, and other nutrient-dense animal foods every few weeks. As with any ingredient, it’s important that you choose the best quality liver you can afford. Fortunately, liver is largely ignored (or abhorred) by most consumers, so it tends to be inexpensive compared to other cuts. For this reason, liver is an ideal addition for families on a very limited budget who want to eat well. You can find grass-fed liver at your local farmers market, and it usually sells for anywhere from $2 to $8 a pound. If you cannot find it locally, you can always purchase grass-fed liver online. If you still can’t stomach the idea of liver, and all the pates, mousses, meatballs, meatloafs, chilies and jalapeno poppers leave you breathless with anxiety, you can still emphasize liver for your family – reaping all its nutritional benefits without making it or serving it for dinner. In addition to the occasional liver recipe that hits our dinner table, I also add liver capsules to our daily supplements (you can find them here). They’re small gelatin-based capsules filled with dessicated, powdered liver. Much like cod liver oil, it’s a whole food supplement – you can find out more about my take on supplements here (including which my family takes and which we skip). 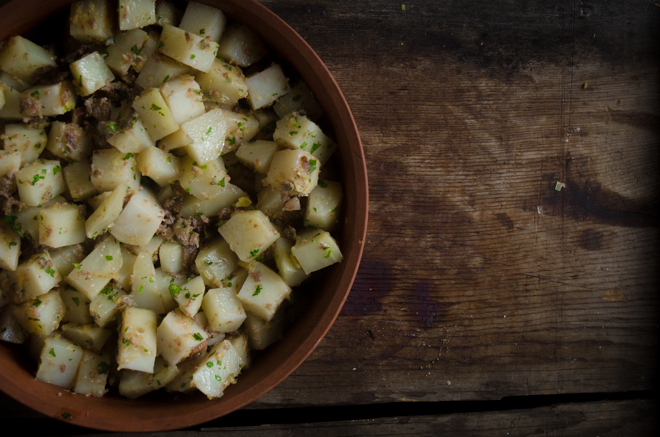 Hearty and rustic, this recipe for Potatoes with Bacon and Liver is simple to prepare, and the typically assertive flavor of liver fades into the background. Place the potatoes in a large stock pot, cover them with water and boil them in their jackets until tender - about an hour. Drain off the water, allow the potatoes to cool until they're comfortable enough to handle, then peel them and cut them into ½-inch cubes. Melt the lard in a wide oven-proof skillet, then toss in the bacon. Render the bacon in the hot fat until it becomes crispy. Turn off the heat of the stove, add the potatoes to the pan, taking care to evenly distribute the rendered bacon among them. Stir in the finely grated liver, and the cheese. Transfer the skillet to the oven and bake it for 25 to 30 minutes. Sprinkle with fresh parsley, and serve. Hey there, I’ve been reading your blog for over a year now and receiving your newsletter. I just wanted to tell you that I’m really glad and very impressed with how you educate your readers. I’ve sent many people who doubt my credibility (mostly friends who refuse to acknowledge self-study as a legitimate credential) to your site and they’ve really changed where they shop, what they buy and how they eat. I’m particularly glad to see you dispel the ridiculous toxic liver belief. I get the same reactions. This sounds so delicious! I’m definitely making it soon. I’m about to attempt your bouillon recipe as I finally have the right gelatin, I’ve been wanting to try it for months! Thank you for doing what you do and for making a difference. I do have one question because I can’t for the life of me figure it out, how much animal protein do you think is necessary on a weekly basis? I know it differs person to person, but I’m afraid my boyfriend consumes too much protein and will end up with a kidney problem. He’s very active and works out constantly, so I know our protein needs are vastly different. I’ve heard something like 3 ounces, and I’d say he consumes two to three times that if there’s opportunity. He says with his working out he needs a lot of protein, and I’ve only found one or two articles on the WAPF website about it with not enough information for me to challenge his opinion. Thank you! I hope you’re having a lovely day! I’m glad you liked it! This potato recipe is crazy delicious! In terms of protein, I don’t really have an answer. I’ve always felt that if you give yourself access to only whole, real foods, you will naturally find the right fit your body needs. That’s all well and good, but we’re constantly being told WHAT to eat instead of HOW to eat and it really can skew perspectives. Too much protein can adversely affect the kidneys, for sure – especially in absence of adequate fat. In my family, we probably consume about 3 to 4 pounds of meat each week. We consume about 2 qts broth daily. Liver once or twice a week in small amounts. And about 2 to 3 pounds of fish/shellfish each week. That’s divided among 2 adults and a child, and none of us work out (like in a gym) though we all lead a relatively active lifestyle, and my husband and son enjoy physical recreation. Protein doesn’t hurt the kidneys, if they’re healthy to begin with. I don’t have the reference handy, but I know that research has debunked that myth. Someone who already has kidney disease probably can’t handle excess protein (or anything else), but it doesn’t cause kidney disease. One thing about protein digestion, it uses up Vitamin A stores, so low-fat, high-protein is not a good combination. We need the fats that come with meats and other animal foods, and other fats, to get our fat-soluble vitamins and to be able to absorb nutrients from our foods. Thank you for this post. I am able to purchase grass fed liver for a very reasonable price. What I do is I slightly thaw it, because it comes frozen, and then I slice it in to small pieces. Each day I add about 10 grams of liver to either my fruity 24 hour yogurt smoothie or I add it to my freshly juiced vegetable juice. Those are small amounts but when you add it up over the week it adds up to about 70 grams(about 1/6th of a pound). Not too shabby. And then if you add in a dish like your recipe it all adds up. I was also wondering about dehydrating it as well and making your own capsules. What do you think Jenny? I love this site. Everything is so doable and informative. The liver recipe takes me back to childhood. We had it once a week. Always lambs liver, lightly fried and served with selection of fresh vegetables. We all loved if. When my own family came along I served it once a week too. In all sorts of guises. It fell out of favour over the last couple of decades due to our ability to afford better? cuts of meat. You have reminded me to get it back on my menu again. Lambs liver is very mild and tasty with bacon and onions. Lightly ‘ floured’ with whatever you can eat creates a lovely crust. Wish you well in 2013. Keep up the good work. Thanks for the reassurance about liver not storing toxins! I never knew what to say to that. It makes sense, because toxins are stored in adipose tissue. The liver doesn’t keep expanding to “‘store toxins,” after all. You read my mind – I was literally thinking about how to incorporate more liver into my diet this morning – thanks! I can’t WAIT to try this. This is the most appetizing recipe using liver that I’ve seen yet. Oh, YUM! I’m fairly certain I won’t be able to add **just** one teaspoon of lard, but this looks amazing! Thank you, Jenny! Not much of a liver fan, though I eat it but not often. But when I do eat it, I eat a lot. To me, a little liver goes a long way. I just wanted to shared a little secret with ya’ll in getting kids to eat liver. I had a 10,8 5 and 2 year old who were awaiting their dinner (many years ago) and I decided to serve liver for dinner. I seasoned it and breaded it, making the portions look like chicken fingers. I cut up some “taters” and made home made french fries as a side and served the meal with a huge bottle of ketchup. I wasn’t going to lie to them if asked if it was liver and nothing was said while they started eating. About 15 minutes later my son asked me (oldest) “dad, is this liver?” I told him yes and announced to anyone that they could stop eating when they wanted, that I wasn’t going to force them to eat what they didn’t want. By the end of the night, very few finger “chicken fingers” were left and of course no french fries and ketchup. I don’t think anyone of my kids ate liver after that, but I gave them a chance to try it, didn’t lie when asked and let them decide if they wanted more. It’s an acquired taste and from personal experience, it takes more than once to convince a youngster to eat it. Force them to eat it and they never will again…….!!! Oh my gosh, I thought I was the only one in the world who eats liver! (Well and my 80-year-old neighbour). Thank you for posting this recipe and for including such wonderful information about the benefits of eating liver. Now I just have to convince my husband to eat it…. From personal experience, don’t convince him. If he isn’t eating it now, he will be hard to convince. I always make my liver stewed, with plenty of tomatoes (fresh-not canned), onions and garlic (the more the better) and place a helping in a plate next to where I am eating. Someone always comes up and asks what it is, and I just say try it if you want….9 times out of time thy at least try the liver. Over a bed of freshly made rice and the flavor is awesome! If you really want to go into testing territory, I also make my liver alongside beef kidney. Stew them together and the liver flavor virtually disappears…. (just cut the kidneys into small pieces for the squeamish around you! )…good luck! My husband was anti-liver, but we had a source for high quality, grass fed beef liver, so I kept trying recipes. Liver in spaghetti sauce? Nope. Diced liver mixed with ground venison for a dirty rice? Hm, OK, but I can still taste the liver… Then I found a recipe for BBQ liver over mashed potatoes…and wow, he has become a liver fan! Thanks again, LOVE your site. Ohh – please share the BBQ Liver recipe. you’ve not mentioned chicken livers,which i actually like, enjoy and can make on my own(over toast? who knew?). i am going to put my guns down and try the beef liver. it’s not something i grew up with(unlike chicken livers which my grandparents ate, along with the gizzard,fried). out of curiosity,the nutritional value of beef is proportionately higher in beef than chicken? i’ll take an answer from anyone who has good info! and thank you for the recipe jenny. this looks worthy of an effort! How do you “grate” liver? I am wondering the same thing. Do we grate it while frozen? That seems like the only way to do it. I just don’t want to have a mess on my hands and waste the grass fed liver that I have. Can’t wait to try this! Our family doesn’t eat pork, but I’m going to use duck fat, which I find to be a good flavor substitute for bacon. Thank you for this recipe! I’m so glad you’re telling the world that liver isn’t full of toxins!! For decades, I wouldn’t eat it because common sense told me that if its main function was to clear toxins from the body, it would be full of them. Only recently have I seen some great, trustworthy informational sources for good health that insist that liver is one of the best animal foods we can eat, so I’ve been eating it again. A seasoning that makes it not just palatable, but enjoyable, to me is Spike Seasoning, which used to only be available in health food stores. Now, however, I can get it from my regular grocery store, along with more mainstream seasonings. A liberal sprinkling of the herbs and spices in it make liver quite tasty, to me. I don’t need any other tricks to enjoy liver–no soaking in milk, cooking on a bed of onions, with tomatoes, nothing! Thanks for that good info re the value of liver. My suggestion is to eat the liver raw or very undercooked. As with all other foods, cooking destroys many heat liable nutrients (many vitamins) and often affects the minerals, as well. I eat my meat raw or very rare. My cats are also served raw chicken liver and muscle meat with their meal and are thriving on it. Take a look at PrimalDiet.com for info on the value of raw foods for humans and all other species. Delicious! I made it with sweet potatoes so my 10 month old could partake and we all loved it! I wondered why you peeled the potatoes? Just for taste? We left ours peel on and it tasted great, but I am lazy like that and never peel anything except oranges and bananas. Hi! I discovered your website about a month ago. I am so happy that I did! It is eye opening and informative. I tried this recipe tonight for my 19 month old daughter and I. We both gobbled it up. I, of course added more liver and bacon to make it more nutritious, delicious and make it a “one pan” meal. Thank you so much for putting this information out into the world. This is a WONDERFUL recipe, particularly if you or loved ones don’t like the flavor of liver. No one in my family suspected the presence of liver. I’ve tried several times to hide liver in recipes but never with any success…until now! Thank you. I see someone else asked this, but got no response. so that the items were put on the conveyer belt in her specific order. Absolutely DELICIOUS! Made it tonight with a green side salad. My husband thinks it would be awesome for breakfast as well with some lovely, runny-yolk eggs on top. Definitely going to be a regular in the menu plan! Thanks for such a wonderful recipe. And, for the record, I have never liked the look, taste, smell or texture of liver even though I knew it was good for me. Solved that! In case nobody else has mentioned this: cut liver up in very small cubes and freeze for whole food cheap and easy supplement “pills”. Totally awesome :). this sounds wonderful! Any ideas for a cheese substitute if I cannot tolerate dairy? Why would you not leave the skins ON the potatoes? Aren’t they also full of nutrients? Thank you and love this recipe and your postings! You can leave them on if you like, but no, they’re not all that more nutritious than the potato itself.